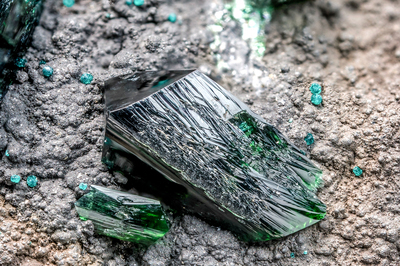 Prismatic crystals of simple dress, greens, of libethenite. Small blue green rosettes are unknown, although their appearance and their color lead me to recognize them as pseudomalachite. Collection and photo of Gianfranco Ciccolini. Nikon D610, bellows, Schneider Kreuznach 35mm; f: 4. Focal using 5.6.